Pull both mounting brackets completely out of their respective slide rails. 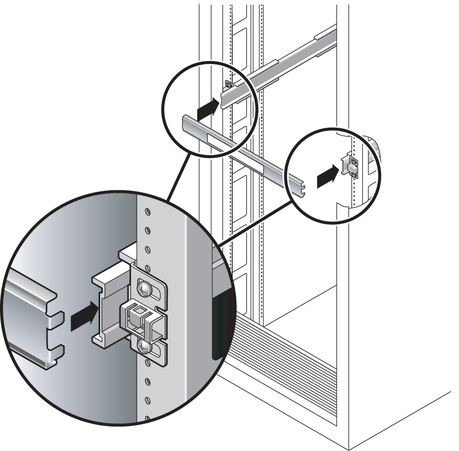 Simultaneously press and hold the upper and lower lock buttons of the slide rail lock. Pull the mounting bracket out until it locks in the extended position. Slide the mounting bracket release button out in the direction shown, then slide the mounting bracket out of the slide rail. 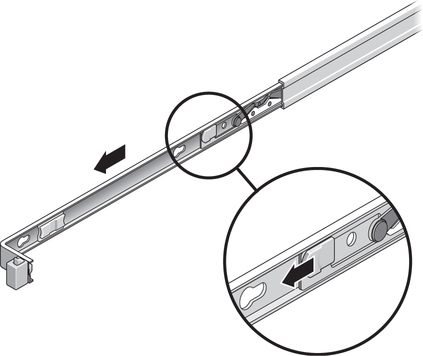 Press the metal lever (labeled Push) on the middle section of the sliding rail, then push the middle section back into the rack. Attach a mounting bracket to the right side of the chassis. Position the mounting bracket against the chassis. 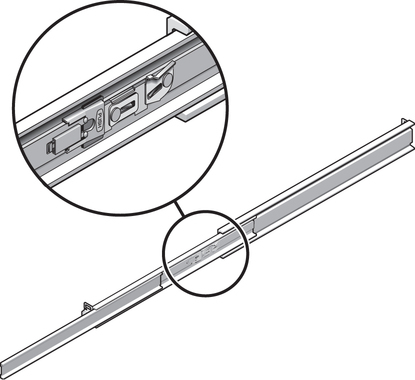 Ensure that the slide rail lock is at the front and the three keyed openings on the mounting bracket are aligned with the three locating pins on the side of the chassis. Ensure that the heads of the locating pins protrude though the keyed openings in the mounting bracket. Pull the mounting bracket toward the front of the chassis until the bracket locks into place with an audible click. 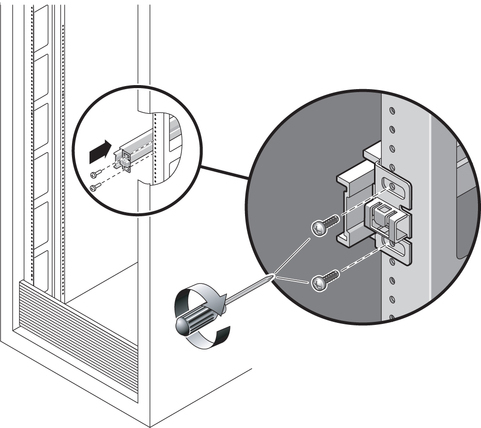 Verify that all locating pins are trapped in the keyed openings and that the correct locating pin has engaged the mounting bracket lock. Attach the second mounting bracket to the left side of the chassis. Determine which rack hole numbers to use when attaching the slide rails to the rack posts. 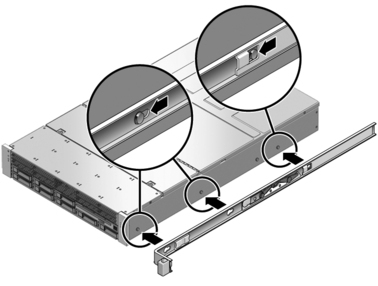 If the server is two rack units high (2U), the slide rails occupy the lower half of the 2U space. Determine which screws you will use to mount the slide rails. If your rack has threaded mounting holes in the rack posts, determine whether the threads are metric or standard. Select the appropriate screws from the package included in the mounting kit. If your rack does not have threaded mounting holes, the mounting screws are secured with a caged nut. Attach a slide rail to the right front rack post. Loosely attach the front of a slide rail to the right front rack post using two screws. Note - Do not tighten the screws yet. Adjust the length of the slide rail by sliding the rear mounting flange to reach the outside edge of the rear rack post. Loosely attach the rear of the slide rail to the rear rack post with two screws. Attach the second slide rail to the left rack posts in a similar manner. Do not tighten the screws. Use the slide rail spacing tool to adjust the distance between the slide rails. At the front of the rack, plug the left side of the tool into slots at the end of the left rail. Insert the right side of the tool into the front end of the right rail. Slide the end of the rail to the right or left as needed to allow the ends of the tool to enter the ends of both rails. The distance between the rails is now equal to the width of the server with mounting brackets. Tighten the screws to lock the ends of the rails in place. At the rear of the rack, repeat Step a through Step d for the rear ends of the rails.